Maple Cinnamon Hummus: Sweeten up your hummus by serving maple cinnamon hummus. Enjoy it as a snack with cinnamon sugar pita chips, for lunch on whole-grain toast with thinly sliced apples or serve it for breakfast on top of warm toast, waffles or tortillas. Warm-Frozen Chocolate Bananas: Here’s a snack that both you and your kids can enjoy, and that has it all: fruit, chocolate, nuts. This healthy summer recipe, perfect for an afternoon playdate or a pre-workout snack, is easy to make. Dip warm, sautéed or frozen bananas in chocolate sauce and cover with your favorite healthy topping such as nuts, dried berries or raisins. 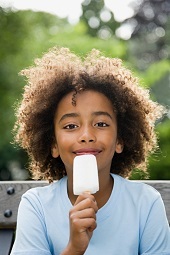 Yogurt Popsicles: Homemade popsicles and frozen yogurt have been popular for decades. Take them to a new high by combining yogurt, honey and ripe berries into a delicious frozen treat. You’ll find recipes on the Internet. Veggies with Peanut Dipping Sauce: Combine smooth peanut butter, honey, and a bit of soy sauce in a bowl and whisk with a fork. Serve with carrots, celery, cherry tomatoes, strips of zucchini or other veggies, or simply serve on crackers. Parents.com is among the websites that carry a recipe for peanut sauce. Healthy Cookie Recipe: Want to bake healthy cookies for your kids? Cookbooks and the Internet carry a range of healthy-cookie recipes. Start with your children’s favorite fruit or fruits, then begin your search. Make sure that your short list includes chocolate as an ingredient. You’re likely to discover a cookie that’s perfect for satisfying an after dinner sweet-tooth but healthy enough to serve as a mid-morning snack. Once your kids try healthy cookies you may have a hard time keeping them in the house. Don’t say we didn’t warn you!